Ravi Karandeekar's Pune Real Estate Investment Blog: Should I buy a 1 BHK Flat for my parents in Playtor at Paud? Should I buy a 1 BHK Flat for my parents in Playtor at Paud? "At the CREDAI Pune Metro Property Exhibition 2015, I visited the stall of Playtor Childspaces (www.playtor.in) by Brick Eagle & Sangam Group. At their project Playtor at Paud, I can get a 1 BHK Flat of 275 sq.ft. carpet area for Rs. 9,99,999 + Stamp Duty, Registration, VAT & Service Tax. Ravi Karandeekar, should I buy this flat for my parents?," Shravan asked me. "Playtor at Paud - for your parents! How old are your parents, Shravan? Playtor is a child centric township. Not senior citizens homes," I asked. "My father is 60 & mother is 50 year old. I am from a small village in Vidarbha. Last couple of years, because of severe drought in our area, my parents are staying with me at Pimple Saudagar - in a rented flat. I am working in Hinjewadi, but, soon, I am going to USA for post graduation. Before going abroad - I want to buy a flat for my parents. Since, my budget is small - I am considering Playtor at Paud," said Shravan. "Shravan, you are calling me because you want to know two things - 1) Is it worth booking a flat in Playtor at Paud? 2) Is this project suitable for your parents? Right?," I asked. "Yes! I want to know whether it is safe to book a flat in Playtor and is it a right project for my parents," said Shravan. "First let us consider the suitability. Shravan, you are working in IT. You must be earning well. If you were not going to USA, would have you considered this project for yourself?," I asked. "Right! Because in that scenario - you would have thought that Playtor is a downmarket project!," I asked. "Yes, of course - I deserve a better home than this!," said Shravan. "Then - a home which is not suitable for you - how can it be suitable for your parents? Don't you think that they deserve better?," I asked. "Yes, they do - but I don't have a big budget!," said Shravan. "If you believe that your parents deserve a better life - a better home - budget is not a problem! They can continue to stay in your rented flat even after you go to USA. Don't you think that your parents would be more comfortable - more safe & more happy at Pimple Saudagar than Paud?," I said. "I told them the same - you continue to stay here - I will buy a flat after I come back from USA. But, they are worried - what if I don't come back - or stay for long in USA - so, my parents say - Better buy a flat for us and then go - come back whenever you want - we won't mind - they feel uncomfortable to stay in a rented flat - you know? I forced them to leave our ancestral home in the village and come to stay with me at Pune - they were not at all ready to come," said Shravan. "If they find it so uncomfortable to stay in a rented flat - after you leave for USA - they can go back to your village! They would be quite well off - in your ancestral home - among your relatives - at your village! Isn't it?," I said. "But, now, they don't want to go back to the village. They want to settle down in Pune," said Shravan. "What about you? What do you want?,' I asked. "What choice do I have? Who am I to say - No. Go back to the village - How can I say so - you know? 10 lakhs is their money - they sold a piece of land for 30 lakhs - gave that money to me to buy a home - in fact - I wanted that money to pay for my post graduation in USA - now, I have decided to take an education loan of 26 lakhs - because of that - like my colleagues - I have to work in USA for 3 - 4 years and come back to Pune - only after I repay the education loan!," said Shravan. "Are you complaining? Do you think - not giving money for your post graduation is - unfair - injustice?," I asked. "Yes - initially - I thought so - but, not now - my parents have done so much for me - I don't have a right to keep on demanding from them forever - now, I can take my responsibility - now, I am an adult - not a child - anymore," said Shravan. "Yes. Now, roles are reversed. You are an adult. But your parent are behaving like a child. They are trying to fulfil their life long fantasy of living in Pune. Better be a strict adult and tell them to go back to your village. Tell them - Pune is no longer a city of pensioners!," I said. "I told them! But - you know what they said? Don't worry - we can sell last few acres and get 30 lakhs more!," said Shravan. "Are you really going to USA for post graduation or are you running away from them?," I asked. "They ask the same question!," said Shravan. For a few moments - both of us didn't say anything. "Whatever! By the way, what is your opinion about the project?," breaking the silence Shravan asked. "I call this project Playtor Potty Homes at Paud. Yes, it's one of the revolutionary architectural concepts by Hafeez Contractor. Geras also have come up with child centric homes in Kharadi. But Playdor Potty Homes at Paud are the true child centric homes. Because, after giving birth - potty training is the most important responsibility of every parent. 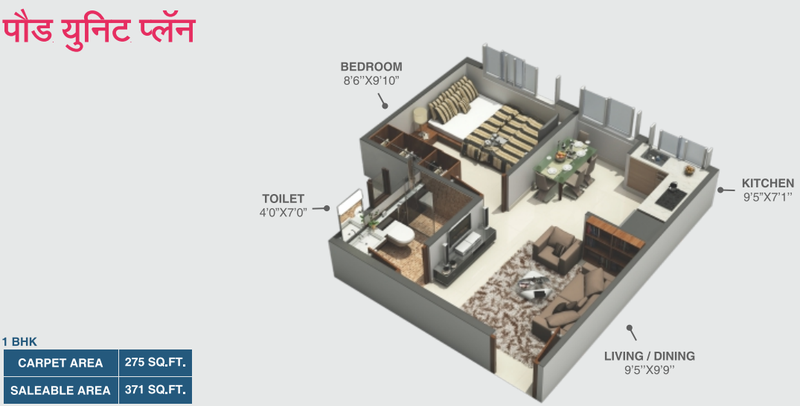 This 1 BHK Flat is designed around potty training. That's why toilet is attached to living. So, when the parents are at home - at Playtor Potty Homes at Paud - they can spend most of their time not in front of TV but giving potty training to their child. Though the children are at the center - Hafeez hasn't ignored the adults. In this flat, when the parents will invite their relatives, friends, colleagues no one will ask - "Susu Karne Ki Jagha Dikha Do!," I said. "Yes! The placement of the toilet is quite odd!! You know? As per Vastu Shastra - placement of a toilet in a home is important for your health & wealth!," said Shravan. "But, Playtor Potty Homes at Paud are for the children of a lesser God - these are affordable homes - homes for lesser human beings - who bothers about heath or wealth of the people how have less money?," I said. "What about the builder?," Shravan asked. "What about the builder - at present the builder has developed only one property - web property - the website - and the builder has proved his marketing & advertising expertise - that's all! People with less property purchasing power are the soft targets of the politicians, builders & scamsters!,' I said. "Do you mean that it's a risky offer?," asked Shravan. "Risky? Have you checked whether it has all sanctions & approvals - including environmental clearance?," I asked. "No? Better go to your parents & ask them - why didn't they send you to school?," I said. Are your parents behaving like a child? Are your parents not ready to live rest of their lives in your hometown? Are your parents insisting on shifting with you in Pune? Are - both of you - okay with it? Are your parents ready to go to any extent to fulfil their lifelong fantasy of living in Pune? Please, share your views in the comments! If you want to ask me, feel free to call me on 919860044110. First 3 minutes are free! And for more than 3 minutes - pay as you wish - you decide the value of my advice. - or on Skype (ravikarandeekar) . Branch- Bajirao Road Pune MICR Code 411014010. My answer would depend on how much he paid you for your advice beyond 3 minutes. Are you making fun of me, GipsyKing? Oh no .. not at all.. I am just interested to know how much did the guy pay for your advise (beyond 3 minutes). I can give him a solution (of the 4) depending on how generous or penny pinching he is.